Small - $40.99 Medium - $40.99 X-Large - $34.99 Only 1 left! You and your kiddo’s precious bath time is a special moment shared between the two of you where you can watch your little one splash in the warm water and play with all sorts of toys before being suddenly assailed with buckets of water with no way to defend yourself. It becomes a warzone. You cannot leave the tyke in the water for fear of the tragic occurring, so all you can do is hold your ground and face the torrent of splashes and giggles as you transform from the dutiful guardian of a child, warm, stoic, capable, into a dripping, sopping wet shadow of your former grace. There isn’t much to be done. If you aim to enjoy some of that ruby ducky time, you just have to deal with the trauma of the splashing. They don’t make dry water, after all. And, if they did, it would most certainly not be anything you’d want to come into physical contact with. Evaporated milk is bad enough! Still, there are a few options, even if they are limited in their nature. You can enjoy some time with the little ducky without having to deal with a tub of water at all! 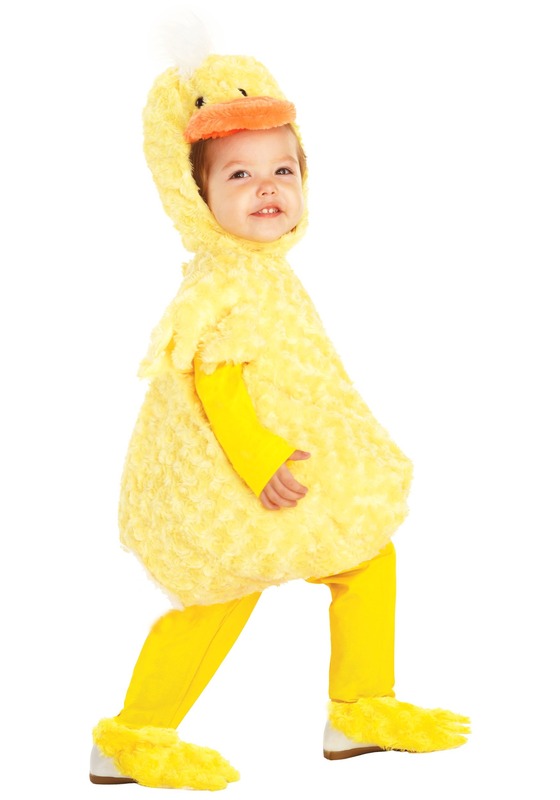 And, here is how: the Toddler Yellow Duck costume. With a simple tug of a few straps of Velcro, your kiddo can be morphed from the adorable tyke before you and into the ridiculously adorable ducky. The soft faux fur yellow body of the jumpsuit will have you tickling your quacker until the sounds are pretty close to actual quacking and you’ll love watching the white tuft of faux fur tail waddle as they run around. The hood pulls up to reveal a ducky face and bill so the transformation can be truly complete. Enjoy your bath time out of the water for once and, when it is time to wash the costume, well, that’ll be one heck of a bath time!